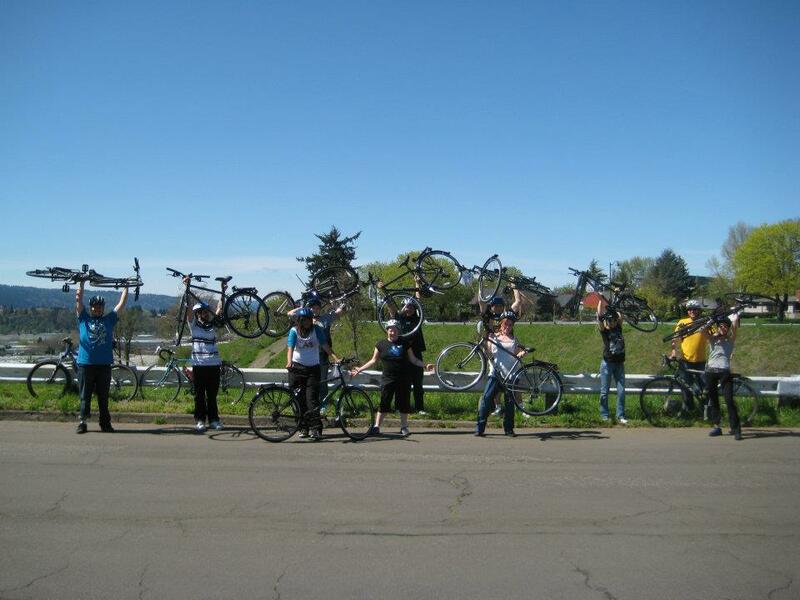 On what was probably the best weather day yet for 2012, Saturday, April 21st, we held our 3rd annual Create a Commuter workshop with Open Meadow in North Portland. 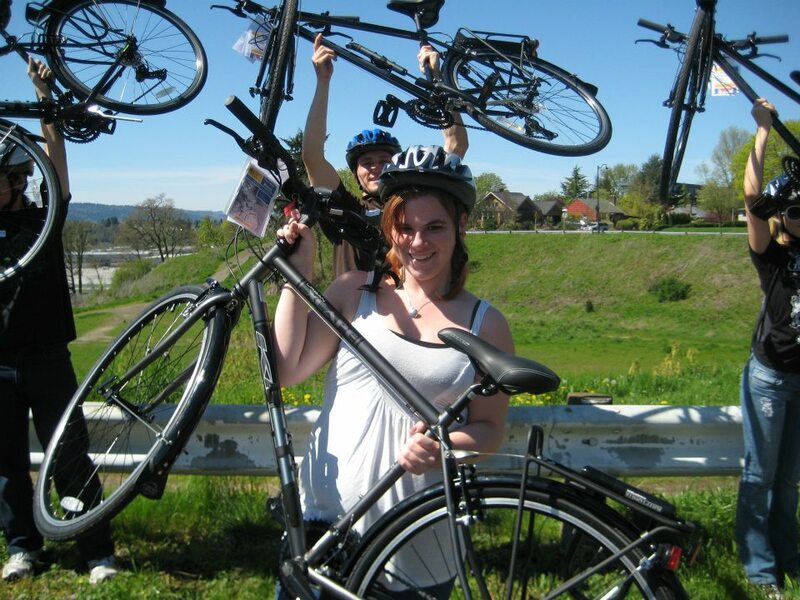 Eleven excited young adults received KHS bicycles, fully outfitted for all weather commuting! They were SUPER excited about the quality of the bikes and the slick fenders, even though they would not be of much use on such a sunny day. The mission of the Open Meadow Career Services Department is to ensure that all Open Meadow youth reach their long-term career goals by providing access to advanced employment, educational opportunities, and focused training. Their program is designed to provide incremental and continuous support for youth from the time they first define their career goals, through their first employment experience, and on into college and career-track employment. Open Meadow works with low-income youth from middle school through the age of 24. Youth from all around Portland are welcome to apply for admission to their career services programs. Open Meadow staff began the day with a fully catered lunch and agency announcements for the participants. While they were eating, Community Cycling Center staff and volunteers were unloading the bikes into a secure back patio area behind the building. It was warm and sunny, and there were beautiful trees in full bloom. We oriented the students to our Create a Commuter program and fitted their helmets before we took them outside to see their new bikes. 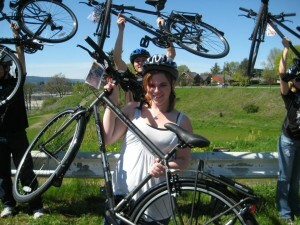 They were overwhelmed with joy when they saw how amazing the bikes were. We guided the participants through the personal safety check, the bike safety check, and practiced loading bikes onto the Tri-Met rack before heading out on a short ride. Everyone did great, job, even those who had not been on a bicycle in years. We talked about shifting and rules of the road, and then went for a 3-mile ride, including 3 bicycle boulevards, a bike lane, the bluffs off Willamette Boulevard, and a school to practice locking up the bikes. Thanks to Open Meadow for the great partnership and the great day. We are excited to play a role in helping 11 Open Meadow participants ride their new bikes to their job training program, and eventually to their new jobs! Pictures by Lee Ann Lawrence.